Steeped in thousands of years history with its centre built around the Roman emperor Diocletian’s palace it is a vibrant city with much to offer. It is much more than glorious architectural scenery. Especially during the summer it is a venue for numerous cultural happenings like film and theatre festivals and concerts. A city which offers eclectic modes of entertainment through street festivals to events such as Ultra Europe Festival visited each year by up to 100 thousand young people from around one hundred countries of the world. Split offers a wide choice of sport activities to its visitors with the Marjan Forest Park, various beaches and sport terrains easily accessible to all. Experience Split in a unique way, take part in a bicycle sightseeing tour of the city. This biking tour starts from the bottom of Riva – the main concourse in the town and almost completely follows the sea-line and thereby explores some of Split bays and ports, swimming beaches, Diocletian’s palace and the forest park Marjan. Considering the numerous options that city offers, the tour can be enriched with various stops, including museum visits, sightseeing of the Diocletian’s palace, swimming, lunch etc. The duration of the program is between 2-3 hours in which time 15-20 km are covered and can be customized according the needs of the client. Watching from sea-level the 1700-year-old palace of Roman emperor Diocletian will provide you a remarkable experience of the Adriatic port of Split. 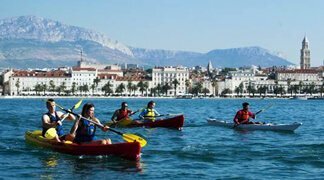 Starting from the western side of the port, the kayaking tour will proceed towards the southern side of Split’s park forest Marjan, passing close to the Maritime research institute and the bay of Bene and back with a drink at the area of the Institute. The program can be enriched with lunch. 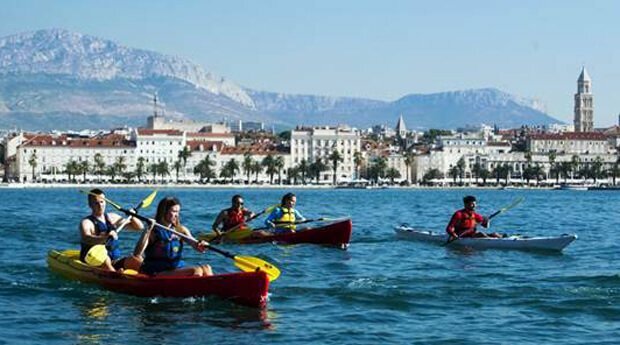 Paddling along the coast takes about 3-4 hours and covers about 9 km showcasing the beautiful natural setting and Mediterranean architecture dominated by the Diocletian’s palace that is under protection of UNESCO. Stand up paddling is an interesting new sport, allowing a unique city experience while relaxing and having fun on your board. This is a sport for people of all ages and once you get on your board, it will feel almost like you are walking on water! Our adventure takes you along the coastline so you will have the opportunity to see the beach Kasjuni that is very popular with the locals and you will go pass Villa Dalmatia, which was once the home of the former Yugoslav leader Tito. You will enjoy the beauties of the park forest Marjan and have a relaxing day while experiencing the city of Split in a way no other tour offers. Zip-line is an adrenaline packed activity in which guests descend through the canyon down a steel cable, secured with a specially designed safety belt. This adventure experience includes a training session and a short walk in nature to the zip location. 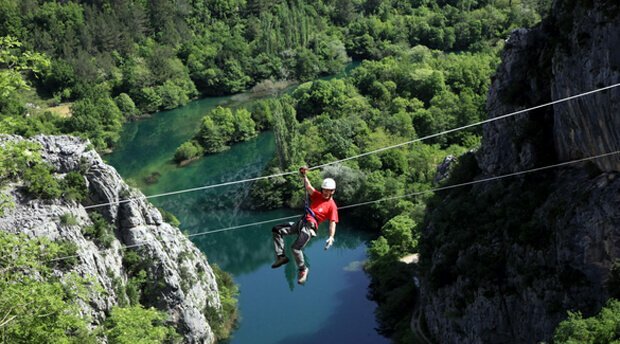 Although not within the city of Split, the zip-line is only 3 kilometres away in nearby Omis, in the canyon of the Cetina River and consists of eight cables with a total running length of 2,100 meters. Depending on the size of the group, zip-line gives you up to three hours of unforgettable fun, spectacular scenery and beautiful nature. In addition to exciting activities available in Split this summer, the destination has been embellished by another five star hotel property. Hotel Park, a historic property dating from the beginning of the 20th century, has undergone at transformation from a 4 to 5 star hotel with an increased in capacity of 73 rooms, underground garages, swimming pools, conference halls with capacity of 250 people, as well as a spa and “glass garden” on the existing terrace. It officially opened its door on June 30th 2015. Learn more about Split , follow us to get more interesting news and don’t forget to share this with your colleagues.